Happy Friday, everyone! Fall is in the air. Leaves are changing color . . . and clogging the gutters ::sigh:: they look pretty doing it though. What's the best thing about Fall, aside from Halloween? Banned Books Week! Yes, I love Banned Books Week, and we wouldn't have it without over-involved parents, the ALA, and all those silly educators out there who are concerned about First Amendment rights. Where do they think they are? The United States of America or something? Yeah, I know. 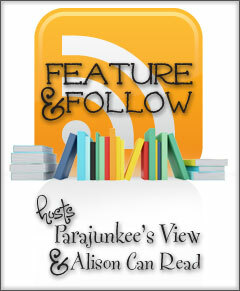 Please join me this fine Follow Friday and enter to win a $20 Amazon gift card to purchase your very own banned books. Entries must be received by midnight on October 8. I hope to become a YA author one day, but blogging is so much fun, especially when it comes to writing a book blog. I've "met" so many lovely writers and readers through this blog and there is such a wonderful sense of community I share with my fellow book lovers that I don't think I could give up the blog even if I become sane and give up the writing.